Time to Play Outside! - Joyful Toddlers! Spring has truly sprung, and in many places, summer is in full swing (unless you’re in the southern hemisphere, of course!). 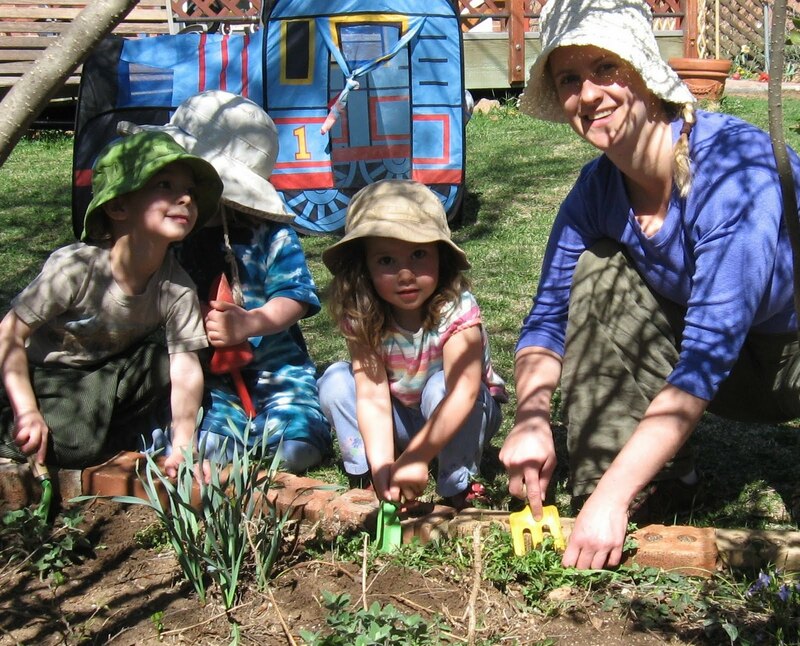 Let me take a minute to inspire you, or re-inspire you, to spend lots and lots of time outside with your children! 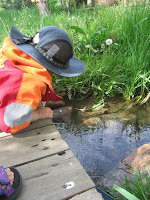 The outdoors is stimulating in all the right ways for young kids. There are interesting things on every level, and everywhere you look there is something new. Sunlight changes and wind changes and humidity changes, and they affect our whole bodies, but in a gentle way. Even on days with intense weather, dress appropriately and go outside! On a VERY windy day, you and your child can be birds, running and soaring through the gale. On rainy days, the worms come up and the robins go down. The dirt turns to mud and everything becomes slippery. Allow your child to experience all of these things, both with you, and (as much as possible) on his own. If your child is not used to spending lots of time outside, it may take him a little while to get used to it. But it’s worth it, on every level! I find that the more time I spend outdoors with kids, the better and nicer our indoor time is. I find that the more time we spend outdoors, the more easily they go down for nap. I find that the more time we spend outdoors, the less picky the children are about their food. And I find that the more time we spend outdoors, the more magnanimous I feel. So, how to spend more time outdoors? Well, build it into your day as a regular staple. Go outside as early as possible, and stay out there as long as possible. When the weather is nice, go outside twice a day! Eat snacks or meals outside. If there’s a neighborhood park that you’ve always meant to spend more time at but only get to every few months, start going every day or every other day. Next, look at your own back yard, and figure out how you can make it a little more magical. Yards become magical by having lots of texture, different spaces with different terrain, and lots of hidey-places. Find a place where two fences meet, and curve a plastic trellis from Home Depot to make a little trellis house! This one I did at Boulder Waldorf Kindergarten, and trained a grape vine over it. 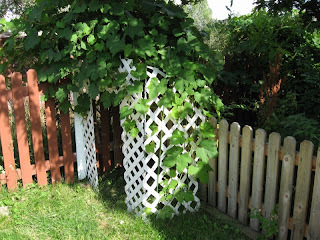 The grapes would grow down through the holes. Fantastic! 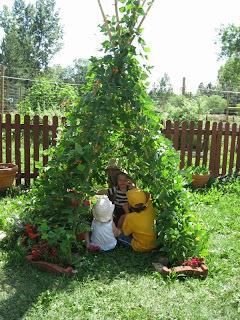 Plant a bean teepee that’s large enough for children to play inside. Plant a blackberry patch. Have a bushy area? Cut the bottoms of the bushes up three or four feet, so that it turns into a living fort. Make pathways out of paving stones or wood chips. Put a row of stumps just about anywhere. Get a pile of bricks for kids to build stuff with, or a pile of river-rocks. A stump cut into 1-inch rounds make great stepping-stones, pathways, plates, boats for mice, and many other magical things. But most of all, just do it! The more time you spend outside, the better everyone feels. Any corner of your yard that’s not currently being used can be infused with energy by putting up a tent, tying a tarp overhead, planting a raised garden bed, piling up rocks, or anything that generates interest. Be sure to bring snacks, and drink lots of water, and then put out a picnic blanket and lie back in the shade while your children explore. Thanks for the wonderful ideas for natural play spaces. 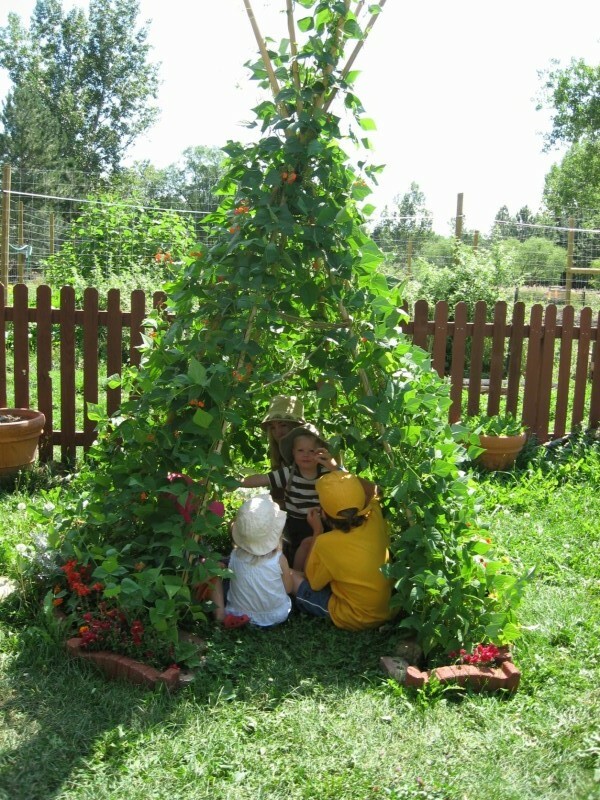 I love the pole bean tee pee! I have been reading and using the tips provided in this blog for months. It really works. My spouse and I enjoy a very, very happy, content and at peace toddler. Love this blog. Thanks for your kind words! I'm glad this is feeling helpful. So where are the instructions for the teepee???? Sure! Here’s what I did: Get 10-12 tall (7-8′) poles (I got mine from a hardware/gardening store; they were bamboo). Get help and have one person stand on a chair in the middle, while the other person places the poles in a circle. The person on the chair gathers them all at the top, then binds them with twine. Be generous with the twine, weaving it in out out in all different directions so that the poles don’t slip. Fold compost into the soil where you’ll be planting, and then plant! You can either plant beans alone, or combine them with flowers or other plants. My “taj mahal of bean teepees” also had brick edging around the whole thing except the entrance. In my play-yard, the rule was that the children could pick anything growing in the grass by themselves, but anything growing behind brick edging needed to be picked with an adult in attendance. 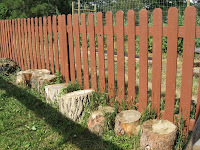 So the brick edging was an important aspect until the beans were growing well up onto the poles. Time to Play Outside! 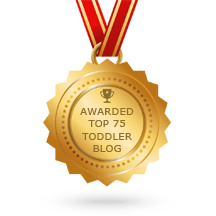 – Joyful Toddlers!